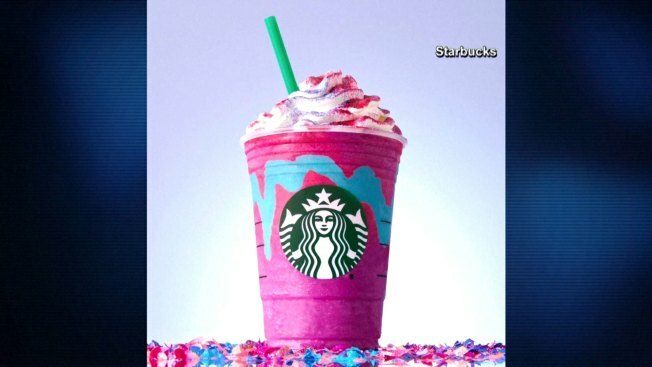 Starbucks' new "Unicorn Frappuccino" has made waves on the internet for its colorful presentation, but a Connecticut health department is trying to draw attention to the large amount of sugar found in the purple-pink drink. On Friday, the Stratford Health Department called out the newest Starbucks treat on Facebook. The post read, "While the Unicorn Frappuccino may be pretty to look at, it's loaded with 59 grams of sugar! That is over two times the amount of sugar recommended by the American Heart Association!" According to the nutritional information provided by Starbucks, a grande size (16 ounces) of the drink contains 410 calories and 59 grams of sugar. The smaller tall size (12 ounces) contains 39 grams of sugar and the super-sized venti (24 ounces) contains 76 grams of sugar. The American Heart Association recommends limiting daily sugar intake to no more than 36 grams for men and no more than 25 grams for women. Starbucks provides the nutritional information for its drinks on its website. Many of the other Frappuccino drinks have comparable sugar contents. A 16-ounce Caramel Frappuccino and Cotton Candy Creme Frappuccino both have 66 grams of sugar, compared to the Unicorn Frappaccino's 59 grams. The Caffe Vanilla Frappuccino has 69 grams of sugar, the Green Tea Creme Frappuccino has 65 grams and the White Chocolate Mocha Frappuccino has 64 grams. Despite the high sugar content, Starbucks lovers are taking the unicorn craze a step further, according to the "Today" show. One Reddit user posted a photo of a colorful lemonade that she said she made with Starbucks coworkers from the powders of the Unicorn Frappuccino. The photo has since been deleted, but photos of similar creations were also posted by Instagram users. The lemonade drink is not on the official Starbucks menu, and the Unicorn Frappuccino is only available for a limited time.